Queens Park Rangers may have given the Football League a multi-million pound headache by winning promotion back to the Premier League. Rangers beat Derby County 1-0 in the Championship play-off final at Wembley on Saturday. Victory secured a top-flight return at the first attempt for the London club. But it may give the Football League a problem recovering a huge sum in Financial Fair Play penalties. Why are QPR facing a hefty financial punishment? Any Football League club that exceeds an £8m loss for the 2013-14 campaign when their accounts are submitted by 1 December this year is subject to a punishment. 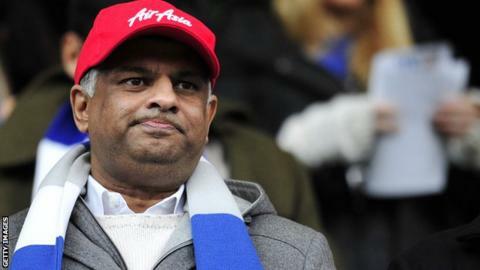 As the 2012-13 accounts of QPR Holdings Limited posted losses of £65.4m, with a wage bill of £68m, it is not hard to envisage another hefty deficit this term given the Loftus Road outfit have lost out on about £50m in television money. The present parachute payments do not come close to covering those losses because relegated clubs receive £60m over four years. QPR may have loaned out a number of high-earning players, including Loic Remy and Adel Taraabt, but many others remain, not all of whom featured in the play-off semi-final win over Wigan. "If QPR or any club breaches the Financial Fair Play rules, there is a system in place that calculates the potential sanctions," said Ian Clayden, a football financial expert, speaking before Saturday's final. "For the Championship, if a club is promoted to the Premier League there is a calculation table which calculates tax, if you will, on the club, based on spending over and above the acceptable limits." But why is there a cap on losses? In 2012, after two years of detailed discussions, the Football League and its clubs agreed on a Financial Fair Play framework across all three of its divisions. A Football League statement said at the time that the framework aims to "reduce the levels of losses being incurred at some clubs and, over time, establish a league of financially self-sustaining professional football clubs". It went on to say "the decision to adopt Financial Fair Play regulations follows a strategic review by the Football League board which identified the state of club finances as the organisation's biggest challenge". Clayden said the rules were put in place because sustainability of football clubs is a key concern of the Football League. "The rules encourage clubs to manage their finances in a way that allows the club to be sustainable," he said. So how big a penalty could QPR face? Had QPR remained in the Football League, they would have faced a transfer embargo until such time as they could "demonstrate they were on track to record acceptable losses or profit". However, having secured promotion to the Premier League, they will be subject to a fine. A club is allowed to lose up to £8m without sanction. Above that level, there is a sliding scale on the next £10m of losses, with a maximum fine of £6.681m. Once losses exceed £18m, the fine is imposed on a strict pound-for-pound basis. So, should there be an overall loss of £30m, the Football League would be left chasing almost £19m. If it was £50m, the figure would be nearly £39m and if QPR were to match last year's loss, their fine would be almost £54m. Are other Championship clubs happy? Not really. The regulations have attracted plenty of criticism from member clubs. For some, the parachute payments, coupled with the £8m losses allowed, distort the finances of relegated clubs. Earlier this month, Bournemouth chairman Jeff Mostyn said Championship clubs were hopeful of changing the Financial Fair Play rules because the boundaries were unrealistic. "We are trying to have the boundaries extended," Mostyn told BBC Radio Solent. "Everyone recognises that, with clubs coming into the Championship with a first-season £23m parachute payment, something has to be done." Mostyn recently criticised the Financial Fair Play rules for being implemented before the parachute payments deal. "The current limitations were decided by a group of people who are no longer playing in the Championship," he said. "There are only about 40% of the clubs playing in the Championship that had anything to do with those and it was prior to the huge parachute payments deal." However, all four proposals - three of them related to boosting the level of losses and owner investment permitted - were defeated in a vote by the 24 clubs. The fourth proposal was for the rules to be imposed based on 'real time' financial figures instead of the existing retrospective system but it, too, failed to attract the necessary 75% backing. Football League chief executive Shaun Harvey said other alternatives would now be examined. Can't the Premier League help out? The Premier League has previously told the Football League it would have no involvement in retrieving the money, considering the matter to be none of its business. Therefore, it would not withhold any television cash from the Hoops, forcing the Football League to actively pursue QPR for any financial penalty. Clayden said: "It creates an added level of complexity as to whether or not one association or organisation can fine one member of another." The situation is further complicated by the fact that any fine, instead of being distributed amongst other Football League clubs, would go to charity. And if the Football League cannot get its money? The Football League believe its regulations are robust enough for them to be enforced but, given the potential sums involved, the chance of them being challenged in the courts is high. Derby will no doubt feel aggrieved if QPR escape any kind of sanction - the Rams have operated within the regulations in the last financial year, posting a loss of £7.1m. They - and others - would argue that the Financial Fair Play regulations are worthless if they have no teeth.